Meet Regalgrid Europe, the company that is revolutionising the clean energy sector. Even though the world of clean energy is changing fast, and the development of the renewable energy sector has become unstoppable, it is still witnessing a lack of innovation and development. This is preventing clean energy from moving forward and triggering that radical shift that is essential to change the way we approach energy production and consumption, ending the fossil fuel era once and for all. Thankfully, I have some great news for you. Just a few days after its launch on the market, Regalgrid Europe’s technology platform became something of a buzzword.The launch coincided with Regalgrid®’s first installation of its revolutionary energy architecture within H-Farm’s facilities. PV Magazine inserted Regalgrid® among the top 10 Array Changing Technologies of 2017 in the PV sector. This is based on selection criteria such as efficacy of the solution, sustainability, degree of innovation and economic impact. Further to a comprehensive description of Regalgrid Europe’s platform, of its innovative features and of its functioning, PV Magazine writes: “platforms like this are seen by many as a vital tool for our energy future – from the creation of energy communities trading rooftop generation, to utilities using such software to balance supply and demand. Technology is making up for the intermittencies inherent to renewable energy”. Regalgrid Europe enables an effective and tangible entrance in a new era of sustainable energy. The innovative Regalgrid® software allows energy sharing to finally come true, by creating an active network of production and distribution of energy that permits real-time sharing of generated and stored clean energy. The immediate recognition of the project’s value and of the idea behind Regalgrid Europe, is a source of pride and satisfaction. As a matter of fact, the major players of the market recognised that the Regalgrid® technology can actually respond to the strong need for innovation, which characterises the sector. In other terms, these market players are embracing the same vision that in 2012 drove the co-founders, Elisa Baccini and Davide Spotti, to expose themselves with a clear idea: playing a key role in the renewable energies global market. Regalgrid Europe is positioned in the market as a provider of services and benefits for users, utilities, installers and E.S.Co. It offers a number of advantageous effects, such as transparency, efficiency, savings, and a reduction in emissions. It is therefore no coincidence that such a valiant product is magnetising a great interest and is making the news. This is further confirmed by the numerous articles and publications that appeared on important websites, such as ansa.it, e-cology.it, solarpv.tv, b2corporate.com, mediakey.tv, h-farm.com, smartcitiesworld.net, energymanagertoday.com. 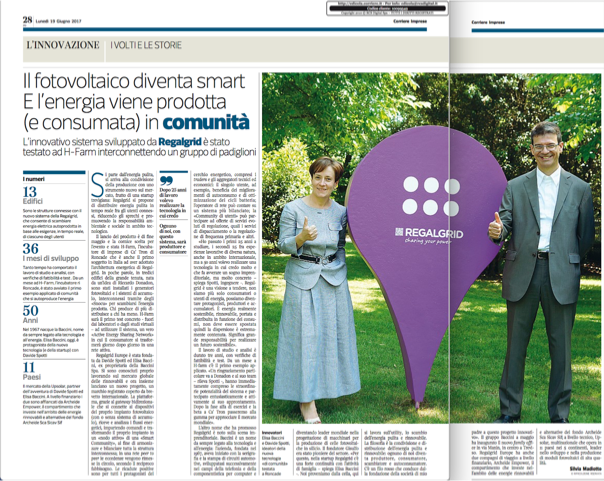 A full-page article published on Monday, June 19, in the Corriere Imprese Nordest is dedicated to Regalgrid Europe, to the description of the innovative system developed by Regalgrid, and to the important work carried out in the industry by Elisa Baccini and Davide Spotti. Regalgrid Europe offers a many-to-many system of energy distribution, interconnected and open. Nonetheless, this openness is not limited to the Regalgrid® system, as the company itself is willing to evaluate partnerships and to develop potential synergies with the sector’s most important market players. The management’s ultimate goal is to expand Regalgrid Europe’s presence, creating and extending its network in the continental market. The combination of Regalgrid’s vision, planning and innovative power, together with the proven quality of the team and the scalability of the project, constitute a firm basis that will allow Regalgrid Europe to play a key role in future energy dynamics, rewriting the energy world as we know it today. Regalgrid Europe results from the fusion of Regalgrid®’s vision and innovative technology, the solidity and financial knowledge of the Archeide Empower’s compartment of Archeide SCA SICAV SIF, the open, alternative private equity fund that invests in renewable and alternative energies, and Upsolar, technical partner of the project and multinational leader in the development and production of high quality photovoltaic modules.